Not So Fast: Print Ain’t Dead Yet! Outperforms Digital by 600%. By the way: That amazing Photo of the HP Indigo 30,000 in the Blog Image above is from our friends over at Tap Packaging Solutions…go check them out! What a beast of a press…Print Clearly ‘Aint Dead for them! Want To Know Where Print Is Headed? Take your direct mail knowledge one step further. 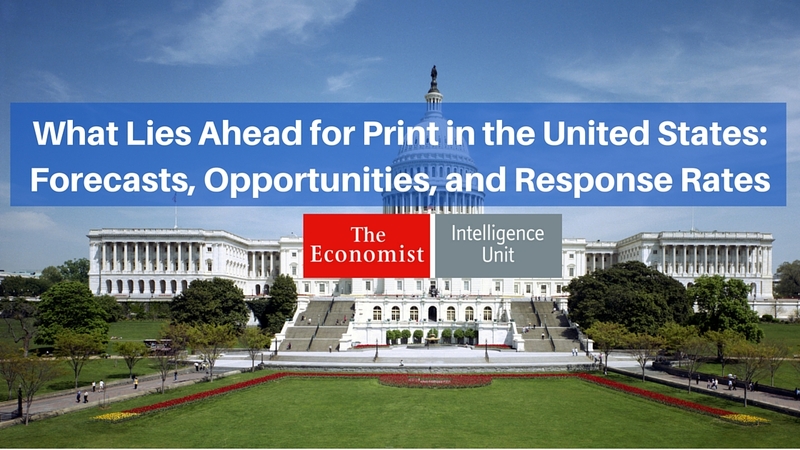 The Economist recently analyzed the future of print in the United States, and we compiled the most helpful data points into an eBook. Get insights to help you create more leads, learn about areas of growth, and see what the experts forecast will happen over the next few years. Download now by clicking below. What Do You Think: Is Print Dead? Now it’s your turn. We’d really like to hear if you’re someone for whom print was “dead” — but you’ve come to find it’s not. What happened? Or, if you’re someone who has used direct mail for a while, but suddenly find it weak and ineffective, we’d love to hear your story too. And lastly, if you’re looking for the report cited in this post, it’s the 2015 Response Rate Report, available from the DMA here. The list price is $499. This should resonate with many printers and marketers! Worth a read. Question: What’s the definition of “Response Rate” in these stats? is it a basic successful contact – the ability to only reach the target and the ability to talk/contact someone without necessarily resulting in sales/revenue? Or does the Response Rate consider those contacts that generated sales? For example, the chart showing the Telephone rates, I’m assuming that’s just the ability to actually reach/talk/contact the target but that doesn’t mean that those calls turned into sales? Correct? Thank you, Laurence. Correct — a “response” does not necessarily mean that there was a sale. Let me know if that changes your view of the data and its implications on your business? Where can I find a link to this study? Hi Brett, thanks for stopping by. The “2015 Response Rate Report” is available from the DMA here: https://thedma.org/knowledge-center/bookstore/. The list price is $499 — but we are checking with the DMA to see if we can extend any savings to folks. We’ll update this post if so. Great Read. Worth the time!! Hey everyone — since publishing this article, we’ve received a number of requests to syndicate the content (folks want this on their site). If you’re interested, please reply here, and we’ll be in touch. Guess it means many of you agree that PRINT AIN’T DEAD? Hey, definitely interested in getting this article on to our site. We have to believe print aint dead or we’d have to retire! A successful direct mail campaign yields a .2-.3% response rate. 1% is obsurd. Hi Joseph, what vertical are you in? I agree with you that in some cases, .2 – .3 is reasonable and still yields a positive ROI. But I have personally seen DM campaigns with much higher response rates. Would love your thoughts — thanks! Being an old direct and database marketer, I am really not surprised at this. The % may be a bit overstated, without more detail about the measurements I can’t say. The real problem is that as the yield from digital fails to meet its promise, the marketers simple redefine the goal. What had the potential to be the most powerful direct medium had devolved into a branding opportunity. Once you start measuring GRP’s and TRP’s (like old TV ratings, you have given up the chance to be a direct medium.Programmatic ad buying makes it even worse. Lick ‘em, stick ‘em still works. David – thanks for the kind words on our blog (http://www.boingnet.com/2016/12/07/personalized-url-hype-vs-reality/), and your’re 100% right – PRINT AIN’T DEAD! What we find so interesting is how important it is to blend print and digital to leverage their respective strengths. As direct and digital teams are being integrated at brands and agencies, the expectation for printers and PSP’s has evolved. When printers walk into their prospects and talk about how they can plug print & mail services into campaigns that leverage Automation and CRM, they become strategic partners, rather than commoditized service providers. Agreed — but many printers struggle with being comfortable talking about print + automation & CRM. But I guess that’s why companies like yours and ours are around. Let’s help! Direct-mail has a much higher upfront cost than social media or email. To make it pay, you need to be highly-targeted, follow best practices in mail piece design (yeah, I agree that adding PURLs works), and most importantly, you need to integrate direct-mail with all of your other marketing methods. The days of “spray-and-pray” direct-mail are over. It’s far too expensive and you will just go broke. We start by very carefully targeting our postal mail recipients, making sure to include all contacts that are also on our email subscriber list. We use digital channels to collect postal addresses, and postal to drive visits to digital. We further refine by matching that list with the list of subscribers that actually reacted to the emails in some way. Each of these groups get variable messages and imagery on the direct mail piece. When we take these extra steps, the response rates can be fantastic. We regularly enjoy response rates exceeding 12%. By response I mean, the recipient takes affirmative action to directly make contact after getting the mail piece. We use every tool in the toolbox to get the job done, and direct mail combined with digital pays every time. I’ve been a list broker since 1986 and I turn customers away all the time who want consumer email lists. They don’t work and I don’t need unhappy customers. DM is so much more responsive and personal, but customers today are in love with the idea of not paying postage. If the USPS could ever get their act together, we could have a DM boom again. Could you apply some numbers to this? Meaning, take an “average” direct mail program, factor in the cost of copywriting, creative, printing, postage and compare it to an online campaign created for the same audience (which will define keywords and the associated click rate and cost per click). Also, calculate the ROI of the project, total amount of gross margin generated by the sales from the project less the cost of the campaign. Then, judgements can be made as to which form of advertising generates a better ROI.